Accor is about to launch their up to 40% off Ibis, Ibis Styles & Mercure Summer 2014 sales for UK and Ireland for stays between July 19 and September 2, 2014. The booking window is from June 2 to September 9, 2014. You can access Accor’s web page for the combined sales here . The terms and conditions refer to bonus Le Club Accorhotels points but the actual sale pages do not. We may have to wait until the sale is live before knowing for sure if Accor has thrown in a bonus. Mercure Sale Is On Now – Save up to 40% In The UK! We have to wait another 10 days to find out if this sale is a good one or not. It may include some Le Club Accorhotels bonus points as well. 1. 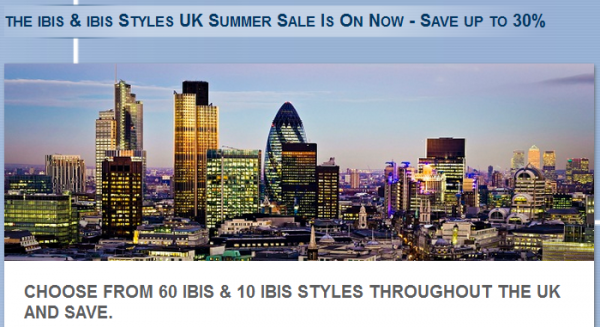 General Le Club Accorhotels terms and conditions apply to the ‘Mercure Summer Sale 2014’, ‘Ibis & ibis Styles Summer Sale’ &’Novotel Summer Sale’ offer. 2. This offer is valid for any ‘Mercure Summer Sale 2014’, ‘Ibis & ibis Styles Summer Sale’ & ‘Novotel Summer Sale’ stay of at least one night done between 19/07/2014 to 2/11/2014 in one of the participating hotels, and booked between 2/6/2014 to 8/9/2014. 3. This offer entitles Le Club Accorhotels Loyalty members, regardless of their status, to benefit from Standard Le Club Accorhotels points (depending on status) at one of the participating hotels in the UK&I.